... and the post has that title because that's how my husband talks about my necklace. He thinks it is leopard when we all know it's tortoise shell ;) I love this necklace and had to wait for it be back in stock, but IMHO it was worth the wait! These shorts are my go-to summer staples. I buy them in multiple colors every spring and wear them all season. I hope the swing sweater gets restocked for the fall! Fingers crossed on the best sweater ever in more colors! p.s. 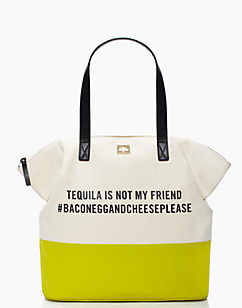 Make sure you check out the Kate Spade surprise sale! There is some good stuff, including this beauty! I love that necklace! I'm obsessed with anything tortoise shell right now! Love it! Oooh love the necklace.. actually I just love the whole outfit! Really hoping they restock that sweater because I need it in like 8 different colors! just saw that bag at the secret sale. so funny. i have a similar necklace and i love wearing it with neutrals and a pop of color, just like you did! That outfit (necklace included of course) is amazing!!!! Work it girl! I have this bag and I'm about to order this necklace - LOVE. You look fabulous, my friend. I live in the Jcrew chinos in the summer- they're the best! I really hope the swing sweater comes back again too! love this look, so simple and classic!